I have attended HSBC Chinese New Year Celebration eight times in as many years. Today, it is a real pleasure to be back for the ninth time. The year 2019 is the Year of the Pig. Recently I attended quite a few Chinese New Year celebrations hosted by British friends from all walks of life. I find that they have different interpretations of the Year of the Pig. Some people think pig symbolises "laziness" and "sloppiness". Some like the "Year of the Boar", because they prefer the ferocity and strength of the boar. The fact is, in China, pig is traditionally regarded as the most important of the six domesticated animals. The Year of the Pig foretells good weather and bumper harvest. Now, what will the Year of the Pig bring to China and China-UK relations? The Chinese economy is drawing global attention lately. Some people talk it up. Some others talk it down. There are worries about the negative impact of China-US "trade war". There are concerns about the slowest growth rate in 28 years. There are even claims that the reform and opening up have stopped or even back-paddled. So, what is the real situation with the Chinese economy? I think the answer can be found in the name of your group, H-S-B-C. In 2018, China continued to be the world's second largest economy, with its GDP setting a new record of $13.6 trillion. More importantly, this is achieved on the basis of optimized economic structure, shifting growth model and greener development. Investment slowed down in infrastructure but accelerated in manufacturing and the private sector. The greatest increase was in high-tech industries. Outdated production capacity was being replaced. New products, new industries and new business models kept emerging. Growth became greener: Energy consumption per unit GDP decreased by 3.1%; the share of clean energy in total energy consumption increased by 1.3%. As a result, the Chinese economy is healthier as it shifts from high-speed growth to high-quality growth. The second letter S stands for "strong". When it comes to China's economic growth, we should look at increment as well as speed. The GDP increment of last year was around $1.4 trillion, which was roughly the total GDP of Australia. It is also much higher than China's own GDP increment of over $600 billion in 2007 when the growth rate was a staggering 14.2%. Over the years, China has been a major powerhouse for world economic growth. We have contributed an average of over 30% to world economic growth. A recent British media report says that, among the "three major engines" of the world economy, namely, China, the US and the EU, China remains to be the largest one with a robust growth momentum. I couldn't agree more with this. The third letter B stands for "bonus". With sustained development, the Chinese economy continues to be a bonus to the world. By importing from the world, China will help balance the world economy, stabilise commodity prices and support recovery in raw material exporters. The Chinese market has been a key force driving global consumption. In recent years, the average annual contribution of China's final consumption expenditure to global consumption growth was 23.4%, higher than that of the US, Japan and the EU. China has also been the world's largest source of outbound tourists for many years in a row. 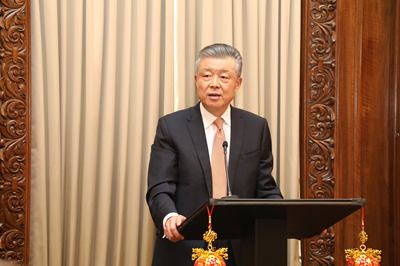 Last November, the first China International Import Expo was held in Shanghai. More than 3,600 companies and over 400,000 purchasers from 172 countries, regional economies and international organisations took part in the Expo. A total of $57.83 billion worth of deals were signed, including £2 billion deals signed with UK companies. Later this year, the second International Import Expo will take place. I look forward to a strong representation from Britain at the event. The last letter C stands for "cooperative". The key word of China's economic policies in 2018 is "openness". This is a solemn pledge made by President Xi Jinping, who said, "China will not close its door; instead, China will open its door even wider to the world." The opening up of the financial sector is also picking up speed. New opening-up measures cover foreign banks, insurance, securities and trust. They will improve the business environment for foreign investment, provide more effective legal guarantee, and boost the confidence of foreign businesses. As a result, 2018 saw China's import and export totaling 30.51 trillion RMB yuan and paid-in investment reaching 885.61 billion RMB yuan. Both set new records. Capital votes with their feet. In 2018, the international community cast a vote of confidence in the economic prospects of China. I hope the HSBC I just outline will bolster your confidence in Chinese economy. And I know for sure that the HSBC Group has been spreading confidence in China through its concrete actions. HSBC is the only financial institution in the world whose name reflects two Chinese cities. It was one of the first British companies to enter Chinese market. It is one of foreign companies that enjoys the closest links with China. It has set up more than 170 banking outlets in over 50 cities on Chinese mainland, topping all other foreign banks. It had been awarded "Best Foreign Bank in China" by FinanceAsia for 16 times in the past 18 years. Please allow me to take this opportunity to pay tributes and offer my congratulations to HSBC for your achievements! Let me quote a famous line from an ancient Chinese poem to conclude my remarks. I'll set my cloud-white sail and cross the sea which raves. 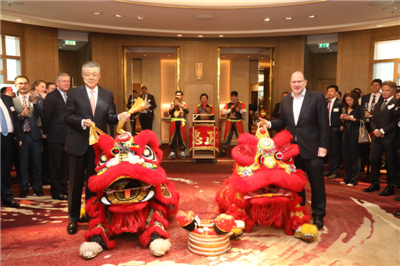 I believe that the Year of the Pig will be an auspicious year for China, a promising year for China-UK relations, and a prosperous year for HSBC. The Chinese name for HSBC is "Hui Feng", meaning respectively "pool" and "prosper". 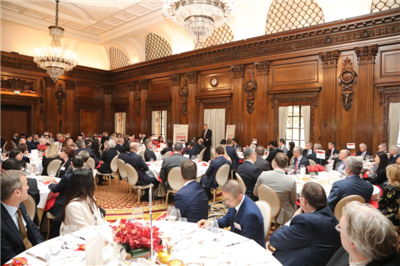 I hope we can pool the wisdom of both China and the UK to make our people prosper and to make new and greater contribution to the China-UK "Golden Era"! In conclusion, I wish you a happy and successful Year of the Pig!